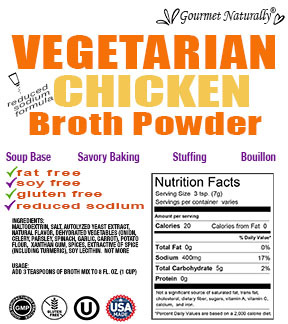 Gourmet Naturally has created another delicious and versatile Vegetarian Chicken Broth Mix, which has 25% less sodium than our original recipe. This broth mix, like our original No Chicken Flavor, is full of flavor but free of fat, monosodium glutamate, and hydrolyzed vegetable proteins. Perfect for today’s busy consumer, simply combine the broth mix with hot water, and you instantly have a broth reminiscent of a slow simmered pot of homemade soup broth. Add 3 teaspoons (7 grams) of Broth Mix to 8 fl. oz. (1 cup) of hot water. Stir and serve.